Marseille striker Mario Balotelli reportedly saw a plan for what could have been one of the greatest goal celebrations of all time foiled against Paris Saint-Germain tonight. According to Canal Plus journalist Olivier Tallaron on Twitter, the former Liverpool and Manchester City man had a shirt paying tribute to Manchester United’s Marcus Rashford on under his main Marseille shirt tonight and had planned to unveil it if he’d scored against PSG. Unfortunately, Balotelli’s Marseille were on the losing side to their Ligue 1 rivals, so we were robbed of what would’ve been one of the viral moments of the season. 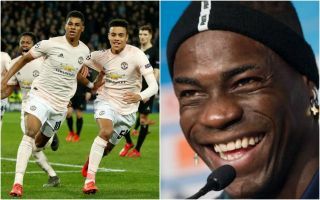 Balotelli is known for being one of the biggest characters in football, though this celebration would have had added controversy due to his connections to Man Utd’s rivals Liverpool and City, whom he both played for in stints in the Premier League. Still, even fans of those clubs would surely have appreciated what would have been some truly world class trolling of PSG here. Rashford, in case you need reminding, recently scored a late winning goal to settle the Champions League tie between PSG and United in a classic at the Parc des Princes – though not one the French champions will want to remember any time soon.